The concluding press conference of the 124th session of the Canton Fair was held in the Canton Fair Complex on Nov 4. Xu Bing, Deputy Secretary General and Spokesperson of the Canton Fair and Deputy Director General of China Foreign Trade Centre, introduced the general situation of this session to journalists from home and abroad. Xu introduced that in the 124th Canton Fair we have followed the guidance of Xi Jinping Thought on Socialism with Chinese Characteristics for a New Era, and implement the spirit of the 19th CPC Congress, the second and third plenary sessions of the 19th CPC Central Committee. With the attention and care of the central government, the State Council, under the leadership of the Ministry of Commerce and Guangdong Province, and with the support of local commerce departments and concerted efforts of all the staff, we’ve completed all the tasks and the fair was carried out smoothly. Xu introduced that buyer attendance of the 124th Canton Fair showed a slight decline and totaled 189,812 from 215 countries (regions), down by 1.11% over the 122nd session. In terms of buyer attendance of all continents in descending order, the number of buyers from Asia totaled 105,692, taking up 55.68% of the total; Europe 35,767, accounting for 18.84%; Americas 27,696, accounting for 14.59%; Africa 14,547 with 7.66% share, and Oceania 6,110 with 3.22% share. Compared with the 122nd session, buyer attendance from Africa increased by 1.15%, from Americas decreased by 0.59%, from Asia decreased by 0.82%, from Europe decreased by 2.93%, and Oceania down by 2.95%. Buyer attendance from China’s top 10 trading partner countries and regions in 2017 accounted for 63.71% of the total. The number of buyers from countries in the “Belt and Road” Initiative stood at 84578, up by 0.16% and accounting for 44.56% of the total. Buyer attendance of the top 20 countries and regions accounted for 64.76% of the total, 3.85 percentage points higher over the last year. The top 10 countries and regions in terms of buyer attendance are Hong Kong, the United States, India, South Korea, Thailand, Russia, Taiwan Province, Malaysia, Japan and Indonesia. Altogether 110 out of the Top 250 Global Retailers in 2018 attended the Fair. Among them there were 9 of the Top 10 retailers: Wal-Mart, Costco, Kroger, Schwartz, Carrefour, Home Depot, Wal-green, Amazon, and Aldi. 8 multinational companies from 6 countries participated in the Multinational Sourcing Service, including Harbor Freight (the US), Lifetime Brands (the US), Staples (the US), Kesko Group (Finland), Auchan Retail (France), Lock& Lock (South Korea), Kawan Lama Group (Indonesia), and Taurus Group (Spain). Regular buyers with more than 10 times’ attendance totaled 49,863, roughly the same over the last year. Buyer attendance proportion in terms of industries is: electronics and household electrical appliances accounting for 40.2% of the total, daily consumer goods 31.3%, home decorations 28.28%, gifts 26.82%, and machinery 26.37%. The export transaction shows slight decline and steps for quality development were accelerated. The accumulated export transaction of this session totaled 206.494 billion RMB Yuan (or 29.86 billion US dollars), a decrease of 1% over the 122nd session. Machinery and electrical products contributed to the highest transaction, at 16.187 billion USD, accounting for 54.2%; transaction volume of light industrial products stood at 7.299 billion USD, accounting for 24.5% of the total; textile and garment 1.514 billion USD, accounting for 5.1%. The transaction volume in brand zone reached 9.45 billion US dollars, accounting for 31.7% of the total. The transaction with the “Belt and Road” countries totaled 9.63 billion dollars, a year-on-year increase of 2.7% and accounting for 32.3% of the total. Of all orders, the proportion of mid- and short-term orders was high while that of long-term orders was still low. 44.6% are short-term orders within 3 months, 30.7% are mid-term orders covering 3-6 months and 24.7 % are long-term orders over 6 months. Xu introduced that facing severe and complicated external environmental, exhibitors made an active use of Canton Fair’s role of a comprehensive platform to enhance their competitiveness. Exhibiting companies advanced their market diversification strategy and optimized the mix by consolidating traditional markets and exploring emerging ones; focused on innovation-led development and made breakthroughs in new product, new technology, new business model and new export destinations. They’ve come up with self-owned brands, high-end, intelligent, green, and tailored products and made faster moves in quality development. “Made in China” is transforming to “Created in China” and “quality in China”. Xu pointed out that Canton Fair’s role as an all-round platform for opening up has become more outstanding. We’ve made a better use of domestic and international markets and resources; we have enriched Canton Fair’s service function and content to play its role of a platform to “buy from and sell to the world”. Firstly, enhanced function to increase export. Seizing the opportunity of brand review, we’ve optimized the structure of exhibitors, products and sections to improve the quality of exhibition. According to the concept of “innovation, specialization, targeted and delicate”, we’ve invited global buyers to attend the fair and diversify the buyer origins to boost export. Despite the fact that we have more and more diversified export channels, Canton Fair is still the most important and irreplaceable platform for Chinese companies to explore the global market and expand export. Secondly, enhanced function of import promotion. The International Pavilion in this session has attracted 636 exhibiting companies from 34 countries and regions; many quality overseas exhibitors have participated with high-end brand and products of high technological content which meet the demands of the Chinese market. According to overseas exhibitors, the Canton Fair International Pavilion is a “fast track” to develop the Chinese market, and they have reached cooperation content with Chinese companies and expanded their business to big cities and chain stores in China. Thirdly, an important channel for meeting new customers. During this session, the number of new buyers amounted to 77733, a year-on-year increase of 2.34%. Canton Fair serves as the main channel for Chinese exporters to meet their clients; for some exhibitors, more than 70% of their clients are known through the Canton Fair, a sufficient resource for their future export. Fourthly, better results achieved in promoting local industry with features. At this Canton Fair we’ve organized 105 promotion conferences of local feature industries and trade matchmaking activities for 20 provinces and cities. We’ve also organized 7 regional industrial clusters to participate and made use of the vast amount of Canton Fair buyers, encouraged local featured industries, companies and brands to go global. These efforts have promoted the development of open regional economy and received great appraisal from these localities, exhibitors and buyers. Fifthly, lead transformation and upgrading with innovation and design. In this session 107 design agencies received 19334 customers /projects, 36% of which are projects to follow up, showing active exchange with exhibitors and design agencies. 629 companies participated in the competition for CF Awards with 1214 products; 100 products of which won the CF Bronze, Silver, Gold and Best of the Best Awards. The awards winning products have attracted huge attention from exhibitors, buyers, media and society, and witnessed increasing negotiation and export. Through design display, design matchmaking and Canton Fair Design Awards, Canton Fair has been leading and encouraging exhibitors to enhance their product design and innovation capacity, create their brand image and cultivate new advantages in foreign trade competition. Sixthly, high-end information function was enhanced. In this session we held 156 conferences and forums, including 20 thematic forums, covering fields such as Canton Fair international trade development forum, trade risk prevention and control, supplier and buyer matchmaking, IPR, fashion and trend, etc; a total sum of over 3000 audiences attended these forums. Canton Fair forums combined the current trend and industrial development and brought forward high-end information with insight and strategic value for companies as well as pragmatic solutions, which were well received by the audience. Xu stated that in this session we’ve continued to provide support to innovation-driven development through IPR protection. The Canton Fair Complaint Station handled 382 IPR cases, with 509 exhibitors filed and 264 determined as constituting alleged infringement. Compared with the previous session, the number of cases handled decreased by 39, the number of filed enterprises decreased by 24, the number of alleged infringement down by 5. The Station also dealt with 41 trade disputes, 8 less than the last session; 24 of them were successfully solved after mediation and in 3 disputes the mediation agreement was implemented onsite by both parties. Canton Fair’s efficient IPR protection has contributed in forming a sound business environment of “value for innovation and respect for IPR”, enhanced the exhibitors’ awareness of IPR protection, and improved Canton Fair’s credibility as a world famous brand. Canton Fair’s IPR protection demonstrated to the world Chinese government’s resolute position of IPR protection by laws and regulations and of innovation encouragement. Smart Canton Fair services were constantly improved. In this session we continue to advance “Smart Canton Fair” to provide intelligent services for exhibitors and buyers before, during and after the show; our intelligent services have been further improved. We’ve achieved full coverage of wifi network in the Complex to provide more smooth and stable surfing experience. The crowd heat map covers the entire venue, showing Canton Fair in all respects in data and providing data reference for attendees. We’ve developed automatic recognition function in the English interface of Canton Fair Wechat account, providing more convenient online services for buyers. We’ve also upgraded the Exhibitor & Product system; by Nov 3, the system has been visited over 220,000 times by people from 213 countries and regions. Highlight products were widely welcomed, which promoted brand companies to promote their images and develop global market. Remarkable achievements in green development. Xu mentioned that in this session we’ve consolidated the progress made in green development and pressed ahead Canton Fair Green Development Plan 2.0. More efforts have been made in the brand promotion of green booths, platform building, material usage, design and innovation, standard setting and industrial coordination of green development to improve the quality and turnover of green development. We held the selection of Green Booth Awarding Ceremony to award 80 winners of green booths in the 123rd Canton Fair; launched the selection of Green Booth Award for the 124th session and 521 custom-built booths applied for it, and we received a total of 950000 votes on Wechat. The environment of the Complex has been further improved: the amount of solid waste has been reduced; that of dust has been constantly declining. The cost of building green booths has also been significantly reduced, structural security of green booths improved and onsite display results enhanced. Xu said that the 124th session has promoted the foreign trade and economic development of poor areas. In this session, we welcomed 668 exhibitors from poor areas, covering 15 product categories and 45 sections; in the Traditional Chinese Specialty section, 157 exhibitors from 22 trading delegations participated. The top 3 largest topics are food, men and women’s wear, and medicines and health care products. Our survey in this section shows that most exhibitors are satisfied with the effect of their participation and wish to participate in the future. Through Canton Fair they have met many customers, broadened horizon, known the latest market information and demand; they have more confidence and resource to come up with competitive feature products and will develop overseas markets in a targeted manner to boost the economic and social development of poor areas. Xu said that in this session we have strengthened our regulations on booth usage, dealt with 34 companies in violation of such regulations. By disqualifying exhibitors, deducting the number of general booths of the trading delegation that the violating exhibitor is in, disqualifying this trading delegation for being commended, and publishing the result of such punishment on Canton Fair Bulletin, we’ve maintained the quality and negotiating order of Canton Fair. We’ve also established the concept of secure development. According to the multi-pronged approach of security ensured by people, technology and objects, we’ve strengthened coordination of security forces of our own and those out-sourced, bettered many kinds of emergency precaution plans, implemented security measures, established a comprehensive security and precaution system, and strived to guarantee security with stricter requirements, higher standards and more solid measures. This session was held smoothly and securely, with no incidents of criminal or public order cases, terrorist attack, fire, food poisoning, major epidemic, or traffic congestion. We created a secure and comfortable environment for customers from home and abroad to negotiate and achieve orders. Xu mentioned that this session was held during the 40th anniversary of reform and opening up and received much attention from media from home and abroad. 360 journalists from 82 media attended and reported on the fair. People’s Daily, Xinhua News Agency, CCTV, takungpao.com, wenweipo.com, Reuters have set up special columns or pages to report Canton Fair’s dynamics and highlights based on their interviews with exhibitors, buyers, local commerce departments and chambers of commerce in a comprehensive and timely manner. MOFCOM Wechat News and Xinhuanet have worked with Canton Fair Press Center to open a Canton Fair news interview room and a special column of “Canton Fair Story”, interviewed key companies and personnel and produced in-dept report on Canton Fair’s efforts to expand export and import, promote reform and opening up, transformation and upgrading and quality development. In “Canton Fair Dialogue”, we invited 7 panelists from home and abroad to share with more than 100 world famous financial media, think tanks and enterprises their stories with Canton Fair, stories of height, depth and personal experience. The above activities and reports echoed the beat of reform and opening up and created a sound public opinion atmosphere for the success of Canton Fair. Stories happened at the fair, like sets of coordinates in time and space, will motivate us to continue writing the Canton Fair legend in the new era and create Canton Fair miracle. According to data released by the General Administration of Customs on the January 14, China's foreign trade import and export scale reached an all-time high of 30.51 trillion yuan in 2018. However, December of foreign trade significantly less than expected: December China's foreign trade 26,748.700 million yuan, down 1.2% year-on-year. Following a sharp decline in foreign trade data in November, foreign trade data fell again in December 2018 and entered a negative growth range. Customs expects that this year's external environment is complex and severe, uncertain, unstable factors are still more, coupled with the base of the elevation and other objective factors, the growth rate of foreign trade may have slowed down. In RMB, China's foreign trade in December 26,748.700 million yuan, a decrease of 1.2% yoy, the export of 15,349.3 trillion yuan, an increase of 0.2% on the same year, imports 11,399.400 million yuan, a decrease of 3.1%. In US dollars, December 2018 foreign trade 3,854 400 million, down 5.8% year on, with exports of 2,212.500 million dollars, a decrease of 4.4% year earlier, and an import of 1,641 900 million. At the January 14 news conference, the General Administration of Customs press spokesman, Li Quiwen, director of the statistical analysis Department, pointed out that in the fourth quarter of 2018, China's foreign trade import and export increased 8.8% year-on-year, compared with the three quarter year-on The objective factor of last year's base elevation was the most important reason for the four-quarter year-on-year growth rate, compared with the three quarter, the 2018 four quarter of China's foreign trade import and export base up 5%. Canton Fair keep expanding, the fourth phase of the Canton Fair complex expansion has entered the preliminary stage of work. On the Jan 8th 2019, the Provincial Department of Commerce launched the "Minsheng Hotline" program in Guangdong. Luo Lianjin, an inspector of the Business Department, revealed in the program that the fourth phase of the Canton Fair complex expansion has entered the preliminary stage of work. 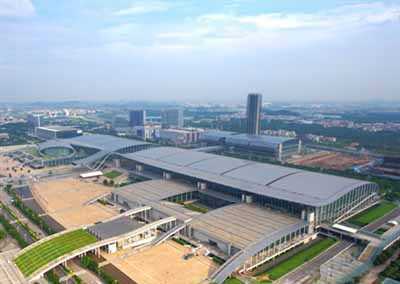 It will expand the two-storey pavilion and prepare the exhibition conference centre to provide support for the improvement of the Canton Fair's exhibition service function. In order to alleviate the contradiction between supply and demand of Canton Fair booths, Luo Lianjin revealed in the program that the Provincial Department of Commerce is currently communicating with relevant departments, creating relevant conditions in terms of capital and land use, and starting the fourth phase of the Canton Fair as soon as possible. The construction of the fourth phase of the Canton Fair mainly includes two aspects. One is to expand the two-storey pavilion, a total of 100,000 square meters, to meet the needs of large-scale equipment entry exhibition, and the second is to build an exhibition conference centre to provide support for improving the Canton Fair's exhibition service function. Sometimes Booking, Agoda has a better price. What city is Canton Fair? Why named "Canton Fair"? Can I access the internet in the Canton Fair? Where is Canton Fair located? Address of the Canton Fair? Which and How hotel shuttle service works?